Canada added more than 34,000 registered medical cannabis patients in the second quarter of this year, an increase of just over 11% from the previous quarter, according to new data from Health Canada. The increase ended five consecutive quarters of slowing growth in the number of registered patients. 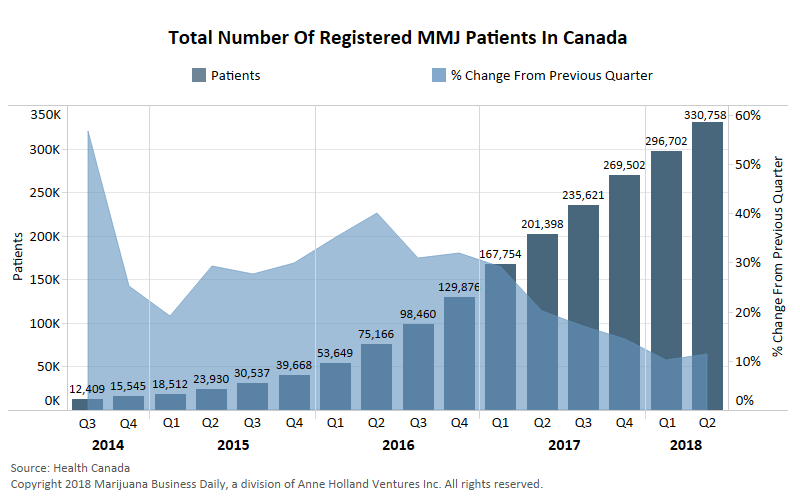 The last time Canada saw accelerating quarterly growth in the number of MMJ patients was when licensed producers added 31,416 registrations in the third quarter of 2016, bringing the total to more than 129,000 by the final quarter of that year – a 31% increase. The country now has more than 330,000 registered medical marijuana patients. Ontario leads with 143,000 patient registrations, followed by Alberta (117,000) and Nova Scotia (13,000). Canada’s medical cannabis companies had been signing up fewer new patients, indicating an industrywide shift in focus to meeting demand in the upcoming recreational market. Recreational cannabis sales are set to begin Oct. 17. However, some companies are continuing to focus on the medical market by forming partnerships with health-care practitioners. CannTrust, an Ontario licensed producer, said in a news release it has captured 36% of all newly registered patients in Canada, based on the most recent quarterly data provided by Health Canada. that don’t buy from Government sanctioned producers, or how many of these patients buy from Gray market medical dispensaries, I will tell you LP sales data is fudged. How can the Legal Providers possibly “fudge” their data, Bob? There is seed to sale tracking on every gram produced with reporting back to Health Canada all the way. I do agree that a lot of medical authorisations in Canada are issued so the patient can apply to grow. This will likely reduce with the advent of legalisation since every household will be allowed to grow four plants. I will maintain my authorisation so that I am able to keep my 25 plant limit.